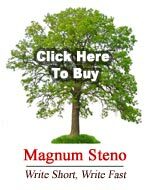 Magnum Steno: Write Short, Write Fast! This amazing book is Mark’s “magnum opus.” Designed for the professional reporter, all of Mark’s short-writing secrets are revealed in an easy-to-study format! 100% satisfaction guaranteed! Students and previous customers! Call 713-837-6595 for a discount on this product!